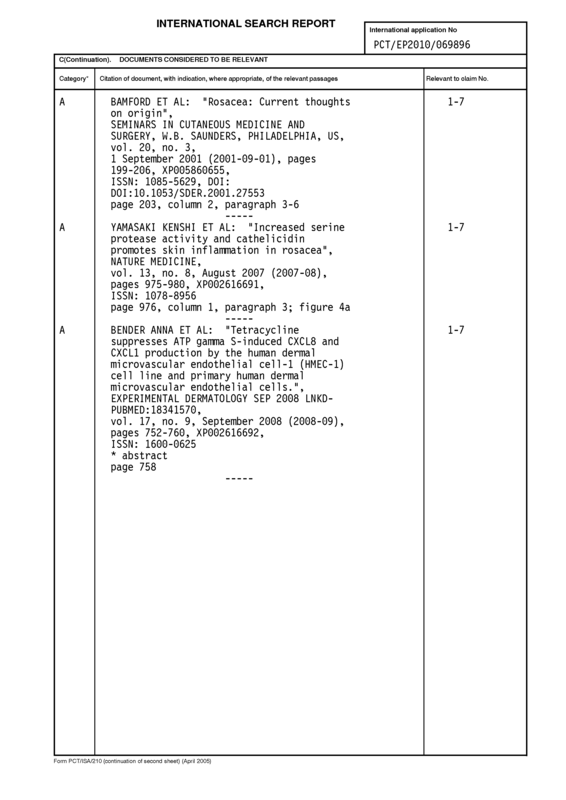 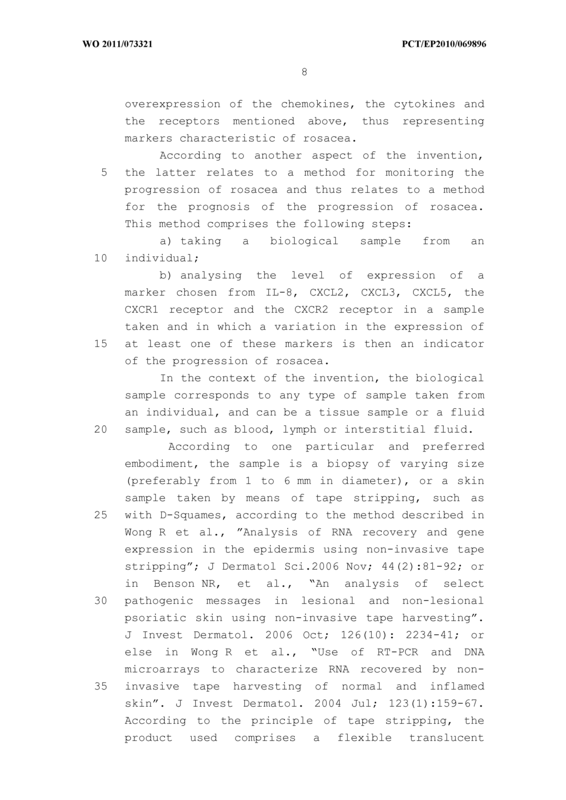 The invention relates to markers for rosacea among the chemokines and cytokines and their receptors, chosen from interleukin 8 (IL-8), CXCL1, CXCL2, CXCL3 and CXCL5, the CXCR1 receptor and the CXCR2 receptor, and also to a method for the diagnosis of rosacea. 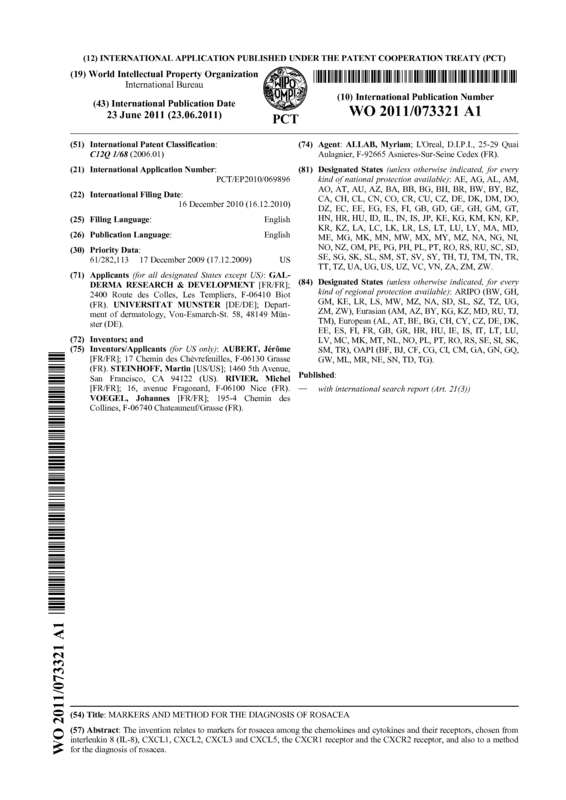 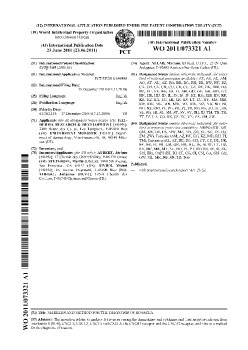 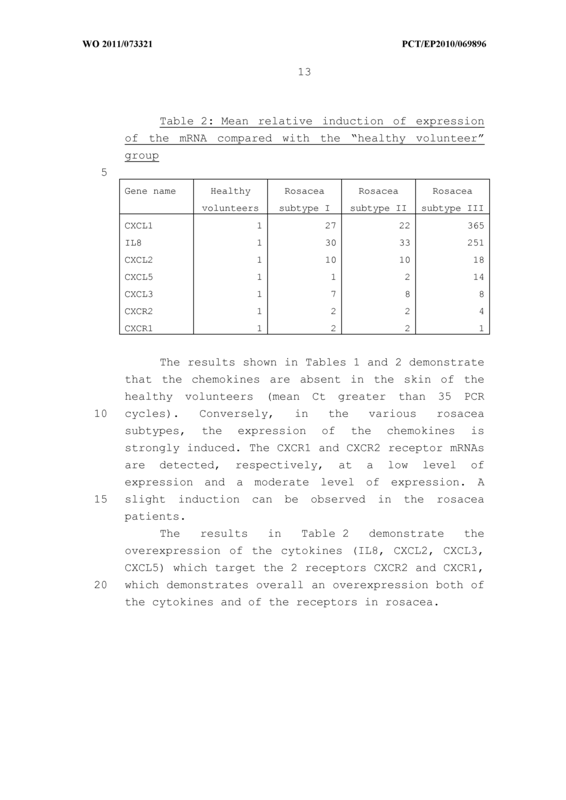 Use of the DNA or the mRNA encoding the chemokines and cytokines chosen from interleukin 8 (IL-8), CXCL1, CXCL2, CXCL3 and CXCL5, the CXCR1 receptor and the CXCR2 receptor, and also the corresponding proteins, as markers for rosacea. 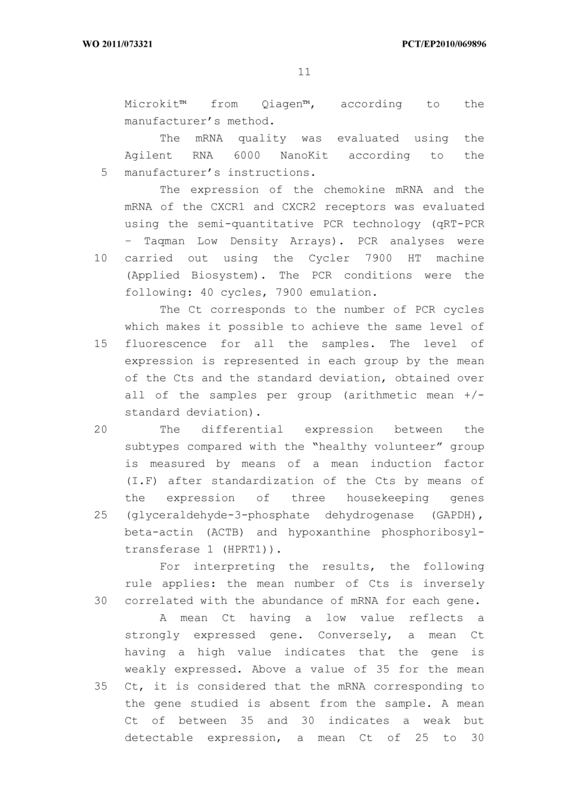 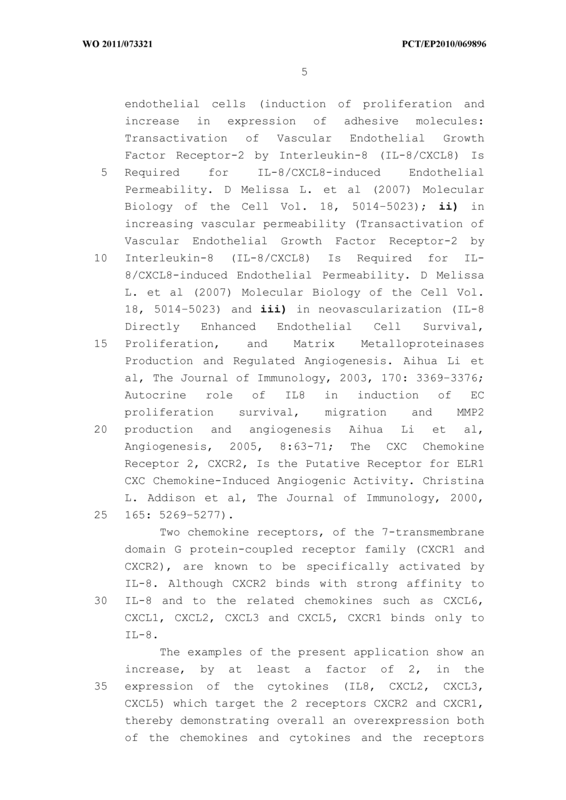 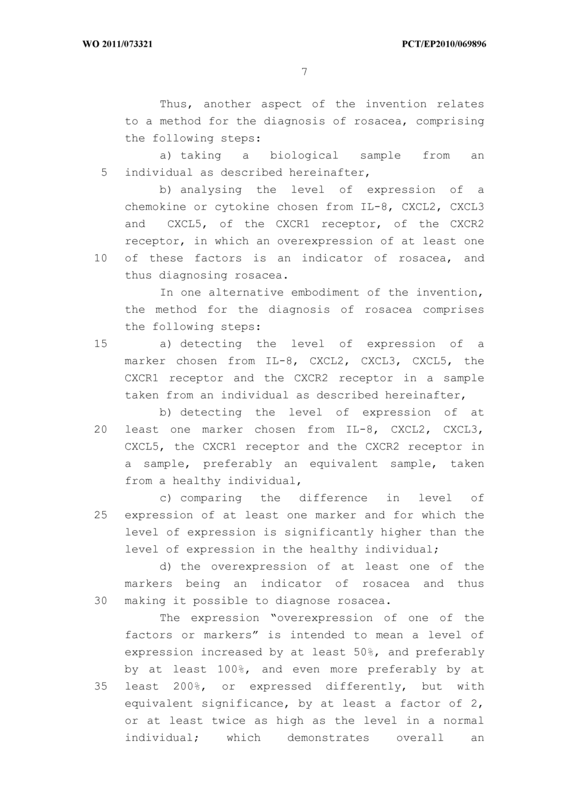 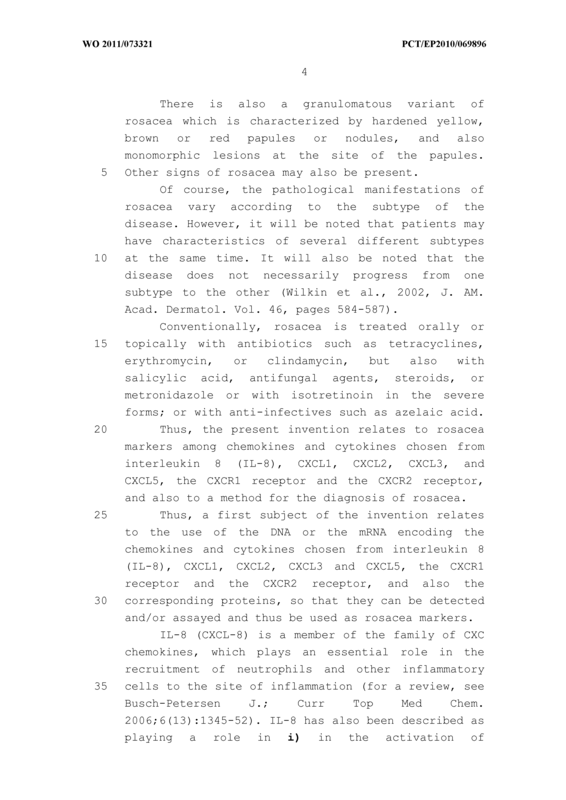 b) analysing the level of expression of a chemokine or cytokine chosen from IL-8, CXCL2, CXCL3 and CXCL5, of the CXCR1 receptor, of the CXCR2 receptor, in which an overexpression of at least one of these factors is an indicator of rosacea, and thus diagnosing rosacea. 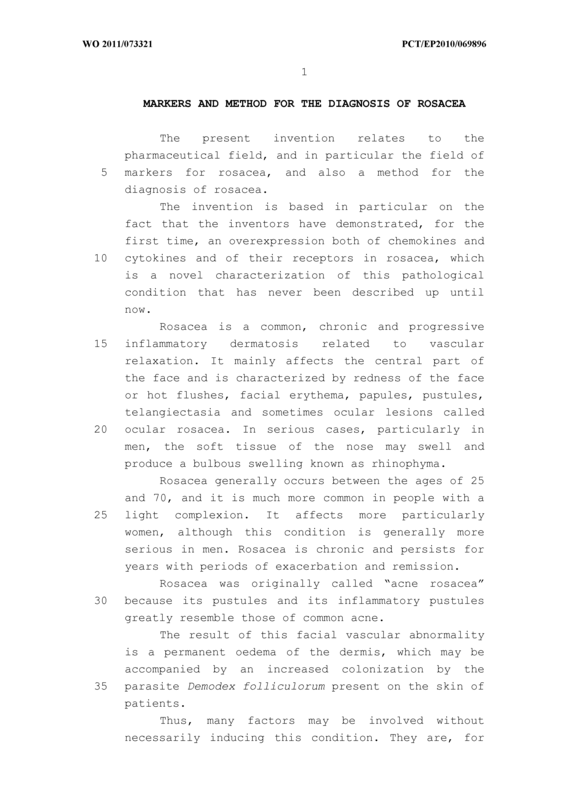 d) the overexpression of at least one of the markers being an indicator of rosacea, thus diagnosing rosacea. 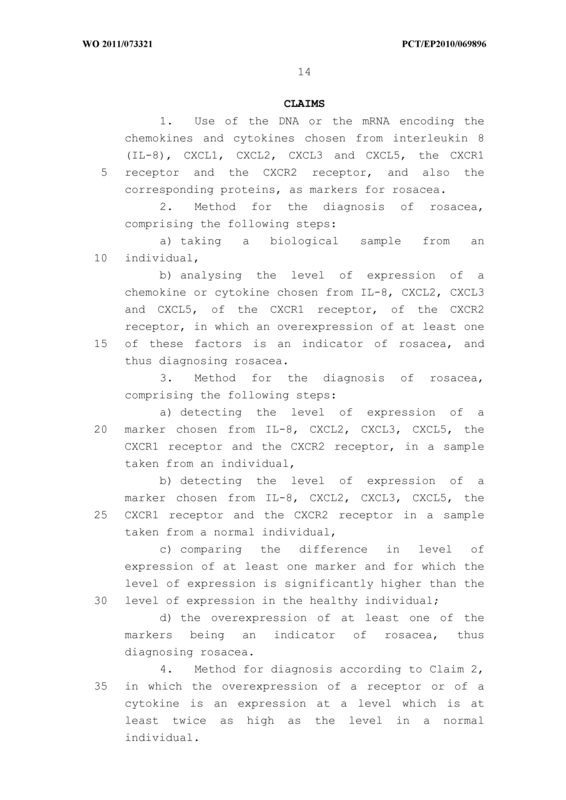 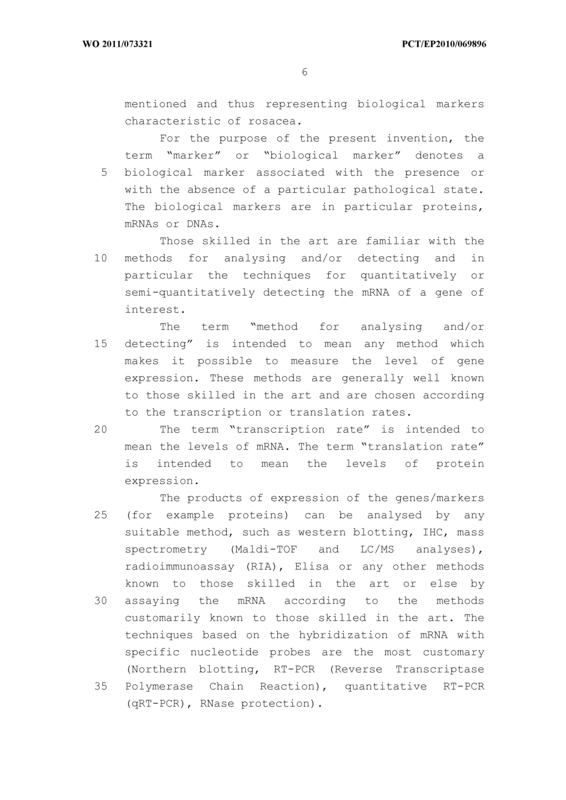 Method for diagnosis according to Claim 2, in which the overexpression of a receptor or of a cytokine is an expression at a level which is at least twice as high as the level in a normal individual . 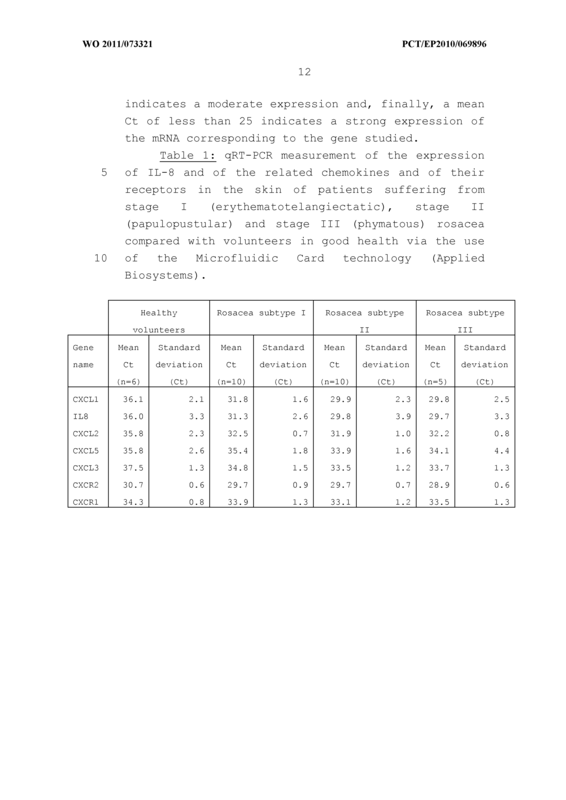 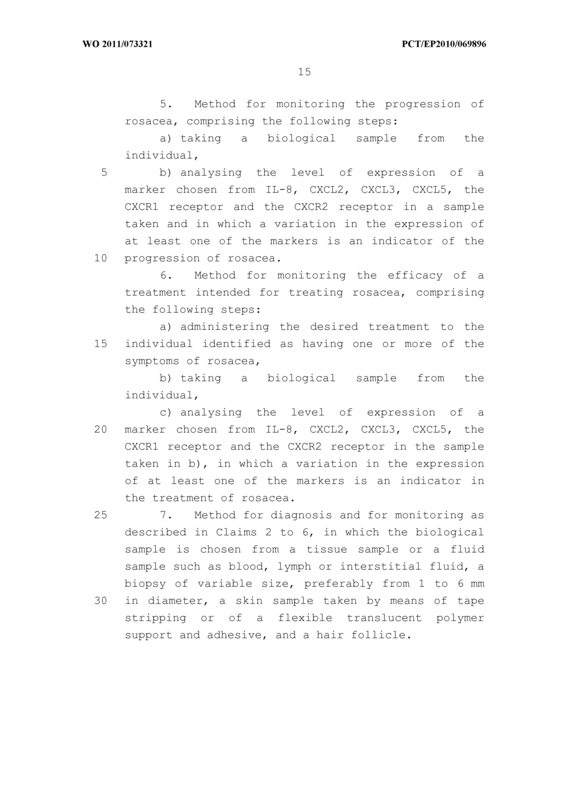 b) analysing the level of expression of a marker chosen from IL-8, CXCL2, CXCL3, CXCL5, the CXCR1 receptor and the CXCR2 receptor in a sample taken and in which a variation in the expression of at least one of the markers is an indicator of the progression of rosacea. 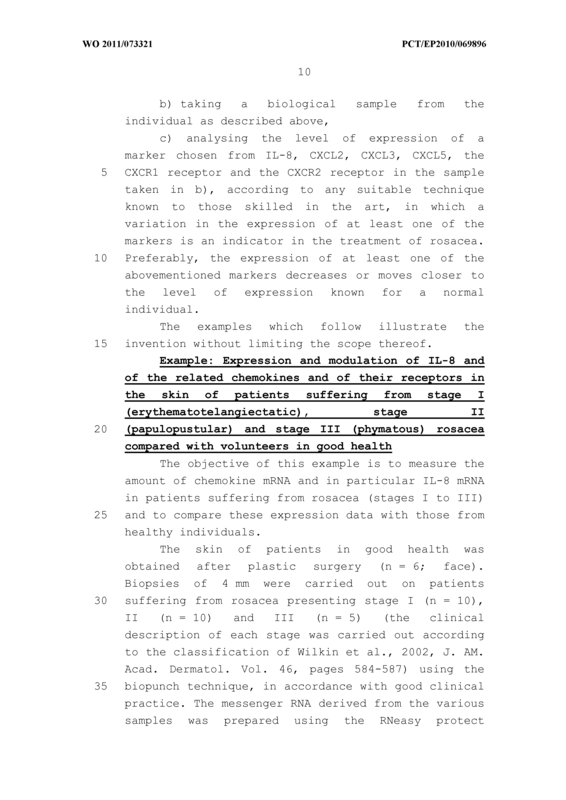 CXCR1 receptor and the CXCR2 receptor in the sample taken in b) , in which a variation in the expression of at least one of the markers is an indicator in the treatment of rosacea. 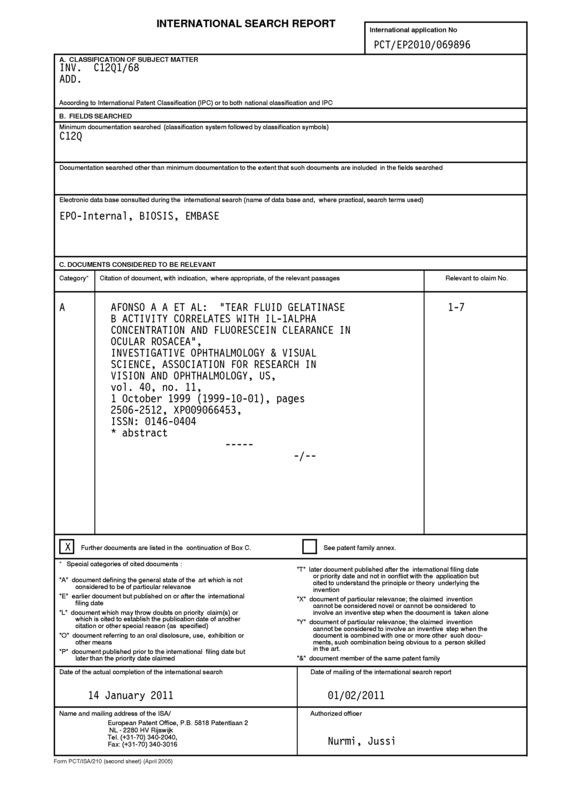 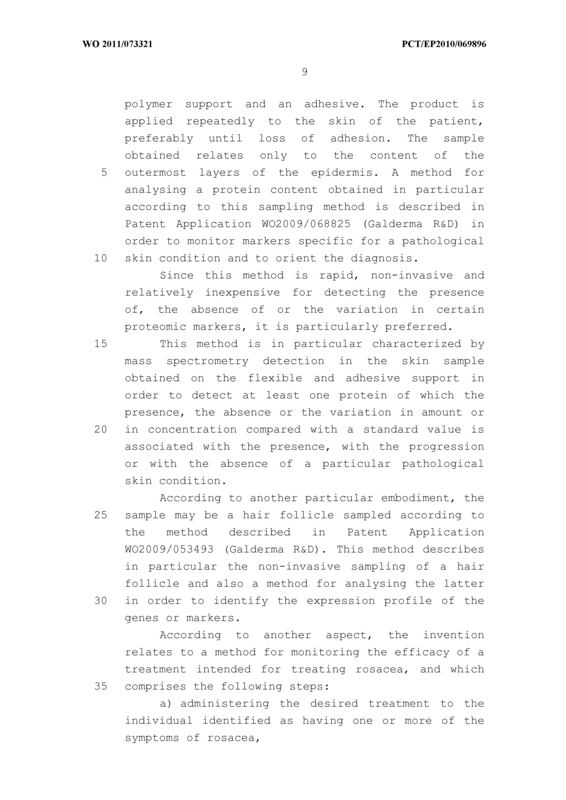 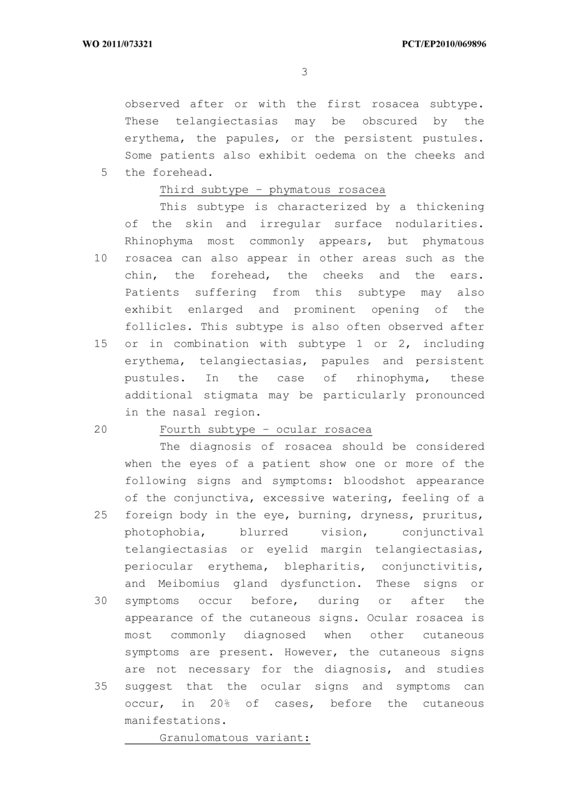 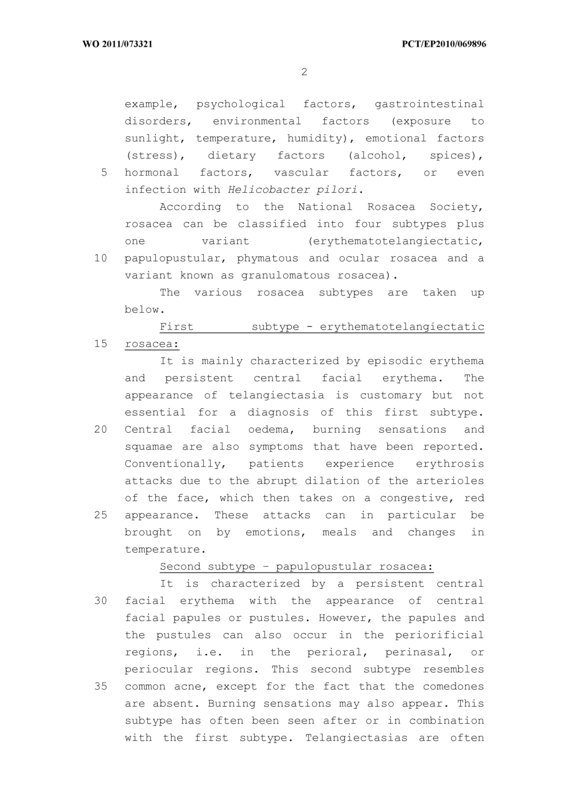 Method for diagnosis and for monitoring as described in Claims 2 to 6, in which the biological sample is chosen from a tissue sample or a fluid sample such as blood, lymph or interstitial fluid, a biopsy of variable size, preferably from 1 to 6 mm in diameter, a skin sample taken by means of tape stripping or of a flexible translucent polymer support and adhesive, and a hair follicle.